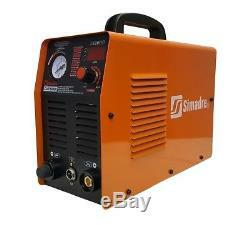 SIMADRE® PORTABLE 50RX 50 AMP 110V/220V DUAL VOLTAGE PLASMA CUTTER w POWER 50/60A TORCH. 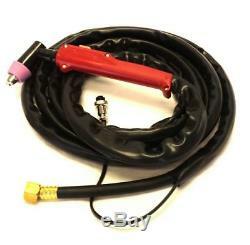 With Accessories & 50 Cutting Torch Consumables! 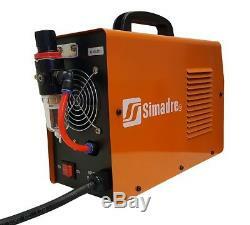 Simadre brings you the latest in plasma cutter technology with the new lightweight and portable 50RX. An affordable high quality machine that performs as well as and in some cases surpasses well known American made machines at a fraction of the cost. Digital Display on front panel. 3" Per minute at 1" Steel (Severance Cut). 7" Per minute at 3/4" Thick Steel. 17" Per minute at 1/2" Thick Steel. Machine is equipped with a large cooling fan and the PAPST Advanced German Cooling System for a longer life span. Equipped with an advanced inverter technology and high cutting frequency V-MOSFET from TOSHIBA/FUJI. EMC, LVD, C-TICK SAFETY STANDARDS. Duty Cycle: Cycle 60% at 50 Amps and 100% at 30 Amps. Max Cutting Thickness: 3/4" Rated 1" Severance Cut. Rated Output Current: 50 Amps under both AC 110V and 220V. 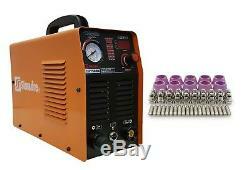 Box size: 17 L x 8 W x 16 H. The item "PLASMA CUTTER SIMADRE 50RX 110/220V 50A POWER TORCH 50 TIPS 1/2 CLEAN CUT" is in sale since Thursday, January 7, 2016. 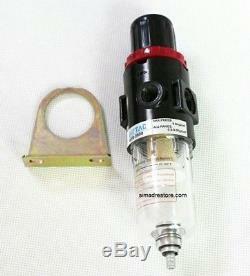 This item is in the category "Business & Industrial\CNC, Metalworking & Manufacturing\Welding & Soldering Equipment\Welding\Welders, Cutters & Torches\Plasma Cutters".